French Immersion is a program designed to offer students opportunities to acquire a high level of proficiency in French while maintaining and developing English language skills. 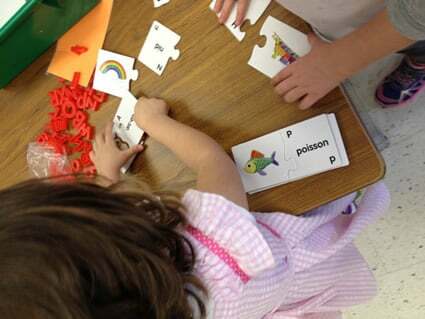 French is the only language of instruction from Junior Kindergarten to Grade 2. Immersion students begin English instruction in Grade 3 and study in both languages until high school graduation. The French Immersion and English programs follow the same expectations in the Ontario Curriculum ( www.edu.gov.on.ca). The difference between the two programs is the language of instruction. A certificate of French Immersion studies is awarded upon successful completion of the program. enriched travel experiences in Canada and abroad. If students hear it, they can say it. If students can say it, they can read it. And if students can read it, they can write it. Effective September 1, 2017, Junior Kindergarten is the only entry point for new French Immersion students into the FI program in the Upper Grand District School Board. Additionally, each UGDSB school that offers FI at the JK level has a cap on the number of students admitted to FI. Entry into FI from other jurisdictions is possible, but not guaranteed, if your child has previous FI experience. Parents and guardians must check with their home school for more detail. For more information on the UGDSB’s French Immersion Application and Selection Process, visit the board’s website. French Immersion Kindergarten application coincides with the regular English Kindergarten registration. For more information on the UGDSB’s French Immersion Application and Selection Process, visit the board’s website.